Sophia Hosain works with ILSR partner Civic Works’ Real Food Farm, which serves communities in and around the Clifton Park neighborhood of northeast Baltimore. Sophia is a graduate of the Neighborhood Soil Rebuilders Master Composter program that Real Food Farm and the Institute for Local Self-Reliance partnered to bring to Baltimore last fall. 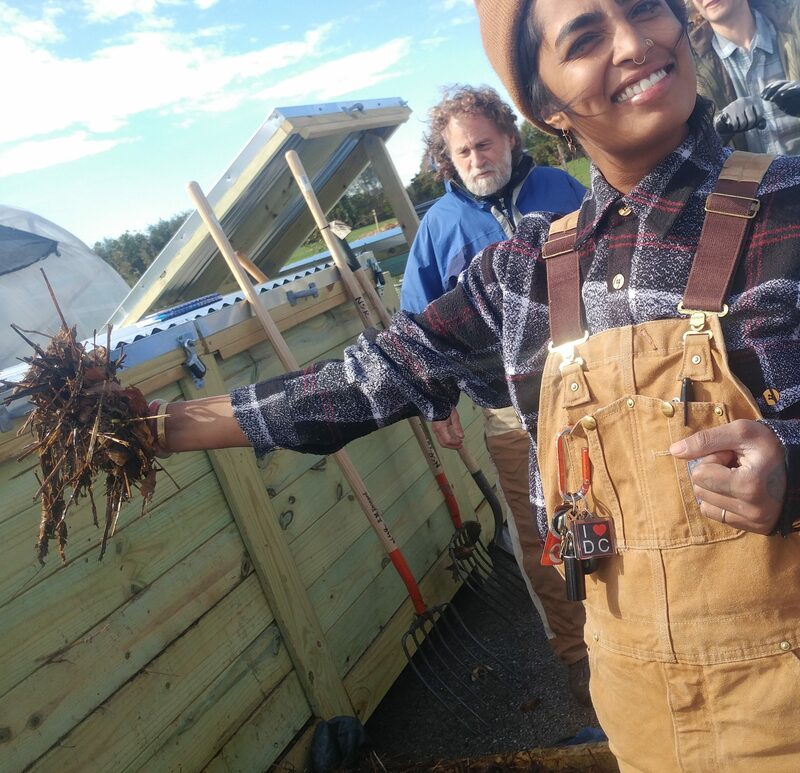 She now manages the farm’s composting cooperative, which serves as a critical engagement touchpoint with the farm’s community, and allows the farm to act as a local composting demonstration and education site for Baltimore. Guy Schaffer volunteers for the youth‐powered, bike‐based composting service, BK ROT, in the Bushwick neighborhood of Brooklyn. BK ROT, started by Sandy Nurse and Renee Pepperone in 2013, brings youth of color into the developing green economy around organics recycling in New York City. Guy recently finished a dissertation on compost in New York City, examining the relationship between municipal organics collection and more informal projects such as BK ROT. In his dissertation, he argues for the value of community‐based projects for pushing alternative possibilities for composting in the NYC. Christopher Mitchell: Hey Linda, I hear you have stat, it’s not really great news but we have good news that will be attached to it. What is that specific? Linda Bilsens: More than 40 million people in the US are considered to be food insecure, which is why composting is such a useful tool because it closes the food loop and helps communities grow more healthy food. Christopher Mitchell: That’s Linda, Linda Bilsens, our project manager of composting for community at the Institute for Local Self-Reliance here on the Building Local Power Podcast one more time. I’m Chris Mitchell. I’ve been here for most of the episodes I guess, I work on a lot of our broadband work but I also really enjoy yelling into a microphone. So, I’m back and Linda is going to introduce our guests who both come from very interesting locations, two urban areas that are doing really great work with composting. So Linda, why don’t you take it away. Linda Bilsens: Thanks Chris. It is my great pleasure to introduce our two speakers for today, Sophia Hosain of Real Food Farm in Baltimore, in the Clifton Park neighborhood, she’ll be talking about the role that her farm plays in addressing food access issues and the role that composting plays in that. Also joining us is Guy Schaffer who works as a volunteer for the youth powered bike faced composting service, BK ROT, in the Bushwick neighborhood of Brooklyn. BK ROT was started by Sandy Nurse and Renee Peperone in 2013, brings use of color into the green economy that’s developing around organics recycling in New York City. Guy recently finished a dissertation on compost in New York City in which he argues that the value of community based projects for pushing alternative possibilities for the composting in the city. Christopher Mitchell: Welcome to the show both Sophia and Guy. As I was just thinking about this I was reminded of stories about ILS Founding, The Institute for Local Self Reliance, in the mid 70s when our founders got together. They had this idea that one could be self reliant inside cities whereas a lot of the thought at the time for people who were thinking about self reliance and how to be less dependent on big companies or federal government programs. A lot of them though you had to live way out in farm countryside and so I think it’s really great to talk about these programs and get a better sense of how we can be more independent and how our communities can solve their own problems locally. So I’m really excited, I’ll probably do more listening than usual, something I should learn in general so Linda if you want to start the conversation I’d really appreciate it. Linda Bilsens: Sophia and Guy I was hoping that you could start by setting the scene for our listeners about your communities, where do you live, where do each of you live and work and what is some of the challenges that the members of your community might be facing, what forces are at work and what opportunities do you see that exist, or maybe don’t exist in your communities. Sophia, do you want to start? Sophia Hosain: Surely, yes. Baltimore is a really interesting place in that it has a unique., kind of socio-political unstable environment. The city is home to thousands and thousands of vacant homes which is really interesting and also has a lot of food deserts. So some of the challenges that we face look like, non-inclusive development, obviously I mentioned the food deserts and it’s still very affordable city. We do actually have quite a bit of opportunity to turn a lot of these vacant lots and vacant houses and vacant green spaces into things like community gardens, and I think that that’s a really nice place where we can bring the compost and we can close the food circle and put it to use to rehabilitate these spaces to bring the power back to the community as far as what they’d like to see happen. Guy Schaffer: Bushwick is a historically black and brown neighborhood that’s been undergoing a lot of really heavy gentrification in the last maybe 10 years or so, and so that kind of the scene in which BK ROT is operating. We’ve been watching as the neighborhood is really slipping out of the hands of the people who have lived there, black and brown people who have lived in the neighborhood for years are losing ownership of these spaces and also just losing opportunities within what Bushwick is turning into. And so a lot of what we’re interested in doing in BK Rot is trying to create a different kind of development in the area that is focused on creating opportunities, for the people who have historically lived there, or the black and brown youth who have been left out of a lot of the development of the neighborhood. Linda Bilsens: The next, I was hoping that each of you could talk a little bit more about the work that you’re doing, groups that you work with, in terms of building local power, how you might be empowering you communities by bringing people together, sharing skills, sharing knowledge, growing food, addressing social justice issues. Sophia do you want to go first? Sophia Hosain: At the Real Food Farm we started processing compost via a compost cooperative, and most of our members come from about a three mile radius around where we’re located, which again is in Clifton Park Baltimore. We’ve created several partnerships with local businesses as well, for example we work with a couple local florists, most often local cauliflower and we take off their green waste from their shop and also we partner with the Institute of Local Self-Reliance and also with [Compost Cabs 00:06:10] who gets to drop off with us as well. We adopted the cooperative model because I feel really passionately about people being able to take initiative and responsibility for their trash. One of the most pressing and upsetting things to me about the way that we live these days is that we buy packaged things, there’s single use items and we put them out in our driveway or on our street to be picked up in our alleys and someone takes them and we have no idea where it goes. But one of the really pressing issues facing Baltimore is that Curtis Bay, which is in the southern part of Baltimore City, it was the most polluted zip code in the United States in 2013 and 14 I believe, That’s because it’s home to five different incinerators and so part of the reason why I am so set on making people responsible for their own food waste is because it is directly affecting their health because these incinerators are putting toxic chemicals out into the air which people are breathing and there’s high levels of asthma and early rates of death in Curtis bay and I’m trying to have people, especially here in the Clifton Park area, just be responsible and change their habits in ways that is conducive to rehabilitating cites soils. So, the cooperative model allows for us to do that in that we’re really transparent in what compost is, how it comes about, how you can do it at home, how you can do it with us, how you can use it in your garden. Ways to just reduce your food waste production at home, because we do have the good fortune of being on a farm we’re able to demonstrate the ways that food can go from ground to plate to compost and then right back into the garden and so you really see the whole picture of the life of food. Guy Schaffer: If I could just ask you a quick question Sophia, you mentioned that you’re on a farm, now that is an urban farm, right? I mean it’s probably one of the few farms that has bus stops nearby, I’m guessing. Sophia Hosain: Yes, it is an urban farm. We grow on about six acres. We actually farm the athletic fields of the school so we have a little bit more space than most of your urban farms. Yes we’re right off of Hartford Road which has bus stops all up and down it but actually there’s quite a few urban farms and gardens in Baltimore. We’re not the only one doing cool composting. Linda Bilsens: Guy, what about yourself, what are you and BK ROT doing in the Bushwick community to empower people? Guy Schaffer: So kind of a central thing in BK ROT is really about jobs creation. We are in a really interesting moment in New York City. The city has [long 00:08:49] and nurtured a strong community composting culture, but that community composting culture is based mostly on volunteer base composting. We’re interested in trying to take this kind of labor, the community should do, in order to keep resources local, and turn it into something that’s a job. There’s not a barrier to entry around who has time to actually do this volunteer work. The way we run our compost system we have youth workers who are picking up food scraps on bike and then doing all the work of processing it, sifting it, bagging it, distributing it. They’re paid 15 bucks an hour, they get the [00:09:30] education around compost, it’s like a good job, these kids are treated as experts because they now how to run a compost system and they understand the science of it and then they also working on getting them public speaking opportunities as they help to represent the org at events and stuff. Guy Schaffer: Bushwick has likewise long been a huge sacrifice zone in New York’s general pattern of environmental racism. Bushwick has been home to a disproportionate amount of the city’s transfer station for decades and so one of the things BK ROT is interested in doing is trying to design ways in which we can deal with waste in a way that is not onerous. 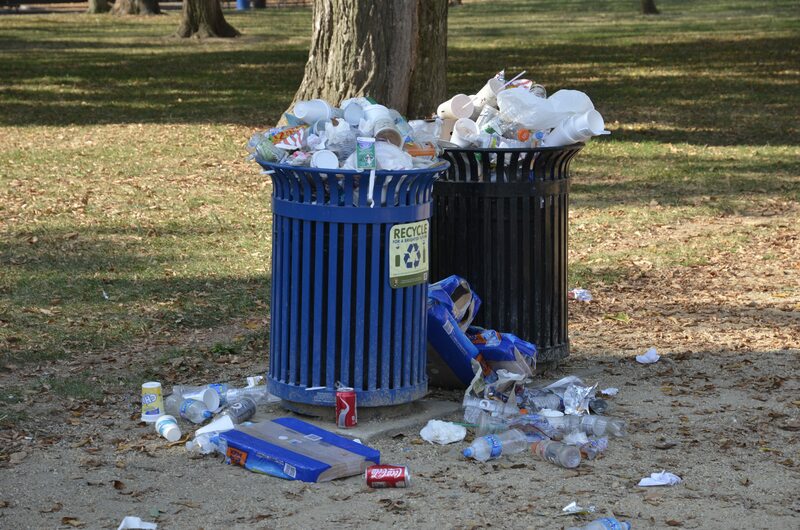 That is, there’s going to be waste everywhere in New York City and if we’re creating waste management infrastructure that’s actually pleasant to be around I think that’s a really important intervention that we can make. Christopher Mitchell: If I hear a critique often about coming form more conservative circles, is that dealing with food insecurity in major cities would be solved better by just getting more Walmarts in and around them rather than anything else and I’m just curious if you can give us a better sense of how your approach is better than looking to a big corporation coming in and just selling more food. Guy Schaffer: I guess the important things for me is just about the way the value is moving in that kind of system. With BK ROT system, and we’re not [specifically 00:11:08] dropping food where it’s more central to us, but we do try to create a system in which we’re keeping value close to us. The value that’s inherent in food scraps is being extracted and distributed to workers within Bushwick rather than being extracted to somewhere outside of the city. And so with food systems there, I think it’s just the exact same thing. We need to, if we’re putting Walmarts in our cities that is really just creating a big siphon for value, pull value out of neighborhoods. Christopher Mitchell: And so Sophia, I’d love to hear your take on it as well. Sophia Hosain: I’m always thinking about should anything happen, should we face a natural crisis, a political crisis, a warfare crisis, what happens to cities? Cities so often only have a three day food supply at most and so if we’re talking sustainably, if we’re talking about creating a system that’s going to work no matter what happens, really making a community wealthy then your food should come from where you live. All that food that comes to Walmart comes from huge mid-western conglomerate farms that really have no interest in the people even eating it, but if we can have people making their own food and using compost that they make from their food waste to make that happen I think that ultimately the community is richer and the individual is richer, and those things don’t happen mutually exclusively and that’s the cooperative idea, that the wealth of the community is individual wealth that no one person is better off without their community being empowered as well. And so I think that when you’re talking about interesting food deserts it’s such a huge problem especially in Baltimore, you’re talking about adding more Walmarts, most of Baltimore is a food desert and what we talk about when we talk about food deserts is like having fast produce available within a quarter mile of where you live. I personally wouldn’t consider the food that you get at Walmart to be representative of what would be a healthy diet. First of all it’s not even an entity that’s dedicated to specifically to providing food. [inaudible 00:13:17] reiterating what Guy said, that wealth that we’re creating from food waste and food scraps needs to be recycled within our communities in order to truly make a wealthy community and a sustainable one at that. Linda Bilsens: I think you guys do such a great job of exemplifying how something like composting fits into this idea of empowering local communities and addressing issues like social and environmental injustices and food deserts in particular, I think it’s a connection that it’s not always a natural connection for people to make so I think that hearing your stories just really helps put that into context. I would also add to the question that Chris just posed, that I think that community gardens, urban farms, community composting, anything like that that you can do in our communities that brings people together and gets people to collaborate on these positive projects, for positive end goal, is just building those connections that I think can’t be overstated how important that is. Especially in a time when there is gentrification and other forces like that that makes it harder for people to connect with each other, just creating positive and safe spaces for neighbors to meet each other and collaborate, I think is a really beautiful and powerful thing, and that’s something that you don’t necessarily get with the big buck store like a Walmart. Christopher Mitchell: I’d love to get a reaction from Sophia and Guy on that point because I think it’s a really interesting point in terms of any examples of communities pulling together and maybe then doing things that are even unrelated to the work that initially started perhaps. Sophia Hosain: One of the awesome things that comes out, like when they were talking about this point of personal connection is, we didn’t move beyond talking about food waste. That is one part of the dire situation we’re facing as earth warriors in the current environmental crisis, it’s not the only one, by being in this cooperative environment and meeting monthly, meeting weekly and turning piles with people from the community and talking about how much food they’re directly responsible for removing from the incinerator waste stream, we get to open the dialog to all sorts of other things, like talking about fossil fuel usage and how most of the people who drop off to our cooperative live within a couple mile radius, we’re talking about alternative modes of transportation, we’re talking about alternative models of economy. Talking about compost as that being a resource that is even greater than money because you can pay infinite amounts of money and never be able to rebuild severely degraded city soils but compost can do that and so we make these personal points of connection and it opens our worlds to talking about all sorts of other stuff, like the – like making vegetable soup out of your food scraps that you don’t necessarily want to throw away, like cabbage ends, or carrot ends, or broccoli stems, just like that point where you can have conversation, where you can meet people face to face where they’re at, where you can have that personal connection and set dialog back and forth it opens the door to infinite collaboration as a community. Christopher Mitchell: Yes, I’m glad to hear that. Guy, I’m just curious have you seen anything like that as well? Guy Schaffer: Yes absolutely. I think the connections you can create with people while doing this labor together. Our current space, Know Waste Lands, is a garden that was designed to be beautiful and open and inviting and people walk in off the street to join us in this space just to look at flowers, we’ve started getting some kids, there’s like a trio of I think maybe 10 year old girls, who just come in and play with worms and they’re great and they’re just like kids who I know now. The creation of open space, the availability of work that is seen as valuable and interesting and educational and uplifting I think it all just goes to, it does pull people together, I mean it builds community, it makes people talk to their neighbors, which has been a really exciting thing, I feel so lucky to be a part of it, and to still be a part of it. Christopher Mitchell: Excellent, so I think Linda has a closing question for you. Linda Bilsens: Thank you both for taking the time to share your stories today, just help put compost into context in terms of building local power. Sophia has introduced us to the Curtis Bay neighborhood which she mentioned about it earlier, being the most polluted zip codes in the Maryland State and so on, but Guy I was hoping you might be able to share a little bit about what benefits you think a project which BK ROT has up in Brooklyn, what can transfer to a community like Curtis Bay in Baltimore and maybe even beyond. Guy Schaffer: I for one want models like BK ROT to be replicated far and wide. I think it is making this really important intervention in the way that waste systems work by taking waste and waste labor and making both of them more visible. Now what that does is I think that it makes people more aware of what they’re throwing away, but also makes people more aware of the fact that work needs to be done in order to bring what they do throw away back into the economy, back into their world, back into the value of their life, and so I think that this model has a lot of potential impact for a place like Curtis Bay. I think it has a lot of potential impact for places that can make use of compost through reclamation of that material through urban farming, I think it has a lot of use for places that have been overly burdened by waste infrastructure and that can benefit from having an actually nice waste infrastructure in the area, I think it could be useful in places that have a crisis of opportunity, like Curtis Bay, like Baltimore, where we need more jobs for people, that are good jobs that pay decently, are rewarding and make you feel like you are contributing to the world. Linda Bilsens: Great answer and I think that is something maybe that wasn’t touched on, is that Curtis Bay not only does it have so many incinerators, it’s also seen a loss of industry over the last decade in terms of manufacturing and ship building so the opportunity to employ local youth is really a powerful, powerful thing. I think in that context especially. Sophia Hosain: Just another dynamic to add to the Curtis Bay situation is that it’s also home to the largest public housing unit. It’s population is by and far very economically depressed. Linda Bilsens: Yes that must be powerful, and Sophia you’re from Baltimore, right? Linda Bilsens: Guy, where are you from again? Guy Schaffer: Silver Spring, Maryland. Linda Bilsens: I don’t know if there’s anything else that you want to make sure we touched on. Christopher Mitchell: Yes, go for it. Guy Schaffer: One of the things that I have been really excited about is being an opportunity present in compost, just inherent in the method is that it’s very low tech and very DIY and doesn’t actually require a ton of investment and so it really, unlike a metals or glass recycling, compost really offers people a way to design, resource recovery systems that work for them and there’s just a lot of flexibility in the design of compost systems. It creates a lot of opportunity for creating more sustainable and more valuable things. Christopher Mitchell: Yes I’m glad you made that point, that’s really, it’s worth remembering these things you can do just about anywhere with a small loan or maybe not even needing that, that’s a kind of opportunity that we need to be promoting. Any closing comment from Sophia? Sophia Hosain: One of the most valuable lessons that I got from doing this often, weekly, every day in terms of making compost is that [inaudible 00:21:20] involving the community in our endeavor were making all of those people co-conspirators in our effort to rehabilitate our immediate environment. Not allies, which sometimes can become a passive thing, but co-conspirators, an active role that your taking in creating a better world that you want to see and it is always amazing and powerful to me. Guy Schaffer: I love that compost conspiracy idea. Christopher Mitchell: Yes and I think on that we’ll probably will close it out. It’s been a very interesting conversation and I’m really glad to know not only that you guys are out there doing this work but that you’re able to share it and I hope that will inspire other people to do these sorts of things in their communities. Linda was there a good place so we can direct people to learn more about the sort of things we’ve been talking about? Linda Bilsens: I think that our website at www.ilsr.org. Christopher Mitchell: Dig into composting at ilsr.org that should be our new jingle. All right well thank you everyone for listening and we’ll catch you in another two weeks with another Building Local Power podcast. Lisa Gonzalez: That was Sophia Hosain and Guy Schaffer joining Linda Bilsens and Christopher Mitchell for episode number 19 of the Building Local Power podcast. Take a look at more of our composting resources at ilsr.org/initiatives/composting. You can learn more about her guest’s projects at realfoodfarm.civicworks.com and bkrot.org. Subscribe to this podcast and all of our podcasts on iTunes, Stitcher or wherever else you get your podcasts. You can also sign up for our monthly newsletter at ilsr.org. Thanks to Dysfunction_AL for the music, license through creative commons, the song is Funk Interlude. I’m Lisa Gonzalez from the Institute for Self-Reliance, thanks again for listening to episode 19 of the Building Local Power podcast.